"Backcountry skiing in British Columbia, alpine climbing in Chamonix, trekking in Nepal�international adventure requires a mountain of equipment. 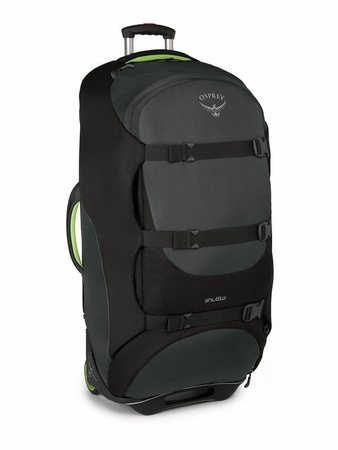 Enlist the aid of Ospreys Shuttle 130L/36"" to roll your gear to the end of the pavement. Made of bombproof ballistic nylon fabric, this wheeled duffle boasts nearly 8,000 cubic inches of carrying capacity. The bag rolls on extra-large, sealed-bearing wheels. Osprey�s extra wide HighRoad chassis has a tough ABS plastic base laced with aluminum stays to create a stable backbone for heavy loads. StraightJacket compression, padded sidewalls and multiple exterior bumpers protect your gear from the ravages of international baggage handlers. Open the panel zipper to access the voluminous main compartment. There you will find a series of inner storage pockets lining the periphery. There�s also a collapsible zippered lower compartment to confine dirty laundry. Exterior features include a top zippered pocket for quick access to small items and a large zippered panel pocket with a drain port for damp storage. There�s a dedicated tablet/magazine pouch for easy access to layover entertainment, and the internal ID card holder helps return the Shuttle 130 back to you should it go astray while making a tight connection between Frankfurt and Kathmandu. Injection molded high clearance ABS base with integrated foot bar. Extra wide 16""/41cm chassis to stabilize large loads. Extra-large 4.25""/11cm wheels with sealed bearings roll smoothly over rough surfaces. Lightweight and strong 6061 aluminum frame for strength and added torsional rigidity. Combines with extra wide interior compression straps to secure and protect your gear in transit"